St. Louis Lambert International Airport Parking Your car can pay for your parking space. 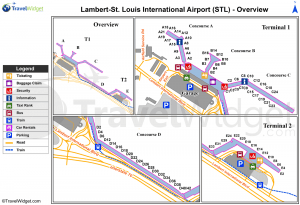 St. Louis Lambert International Airport Parking : Are you a frequent traveler taking flights at St. Louis Lambert International Airport? We have a deal for you. TravelCar is currently one of the most reputable transport company in the United States. This means we deliver nothing but the best travel and parking experience. We have a myriad of services that we offer our clients: cheap parking options, car maintenance at the parking lots, ride-sharing services, and car rentals. TravelCar is based offsite at St. Louis Lambert International Airport and has a reliable shuttle service to the airport terminals. We are also located at other airports in The State of Missouri and busy airports in the United States of America. You can also find us at city centers like Berkeley and Bridgeton in Missouri; notable train stations such as North Hanley Train Station and seaports like Port of Metropolitan St. Louis. If you need any clarification on our availability in your location or have inquiries on our services, please reach out to us via phone on +1 888-807-0209 or have a chat with our agent on the website www.travelcar.com. 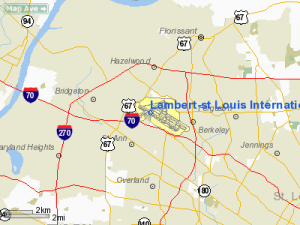 St. Louis Lambert International Airport is located 23 kilometers North-West of St. Louis Downtown. It is the most prominent and busiest airport in the State of Missouri. The airport is in St. Louis County. The City of St. Louis owns the airport while the St. Louis City Airport Commission runs the airport. St. Louis Lambert International Airport was built in the year 1925. It has four runways, two passenger terminals, and five concourses. STL serves the Greater St. Louis area in the State of Missouri. St. Louis Lambert International Airport is seconded in commercial flights by MidAmerica St. Louis Airport in St. Louis region. In passenger enplanements, St. Louis Lambert International Airport takes the lead, closely followed by Kansas City International Airport in the State of Missouri. STL is the 32nd busiest airport in the United States of America. The airport is a primary hub for Cape Air and Air Choice One. It is also a focus city for Southwest Airlines. In 2017, St. Louis Lambert International Airport recorded traffic of 14,730,656 passengers and 196,405 aircraft operations. Other airports in the State of Missouri include Kansas City International Airport, Branson Airport, Waynesville- St. Robert Regional Airport and Springfield-Branson National Airport. It is essential for you as a traveler, to note that TravelCar gives low-priced parking deals to clients under its subscription. 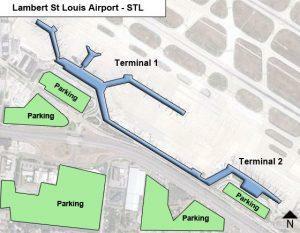 St. Louis Lambert International Airport has several parking arrangements both onsite and offsite. For short-term parking arrangements, STL airport has Hourly and Daily Parking lots. Hourly parking is accessible in both terminal 1 and 2. The Daily Parking Garages include Lot A and Lot E.
As mentioned earlier, you may only get these fantastic deals at TravelCar. We offer low-priced parking at St. Louis Lambert International Airport to accommodate travelers with low parking budgets. Another reason is to allow you the chance to explore St. Louis region, most especially if you have an artistic flair. You may want to check out the St. Louis Stage that gives a platform for incredible artistic performances at the airport. As an extra service, we oversee car wash, tire changing and oil changing on your automobile. Car detailing and vacuuming is also available upon request. Our parking areas are protected, that is, they are gated and have video surveillance. CCTV cameras are installed both in and out of the parking premises. There are guards employed to keep order and ensure security is maintained both day and night. Our parking slots are covered to protect your automobile from excessive sunlight exposure. We are offsite but have a frequent shuttle service that is five minutes away from the airport terminals. Apart from giving low-priced parking at St. Louis Lambert International Airport, we offer similar services at major city centers, train stations, hotels and seaports in the State of Missouri. Access low-priced parking at the city centers of the following cities around St. Louis Lambert International Airport: Hazelwood, Clayton, University City, Jennings, Overland, and Saint Johns. Other small towns include Pattonville, Edmundson, Cool Valley, Ferguson, Robertson, Kinloch, Woodson Terrace, Calverton Park, and Saint Ann. You can also visit downtowns in Mary Ridge, Bridgeton Terrace, Breckenridge Hills, Berkeley, and Bridgeton. TravelCar offers low-priced parking and car rental services at various airports in the country. Below is a list of bustling airports regarding passenger traffic. Concourse B B2-B4, B6, B7, B8, B10, B12, B14, B16 Currently available for rental events. At TravelCar, it is all about achieving a fruitful travel experience. To access the airport from neighboring cities, small towns, seaports, train stations, and hotels, you can choose a car rental from us. Another alternative is public transportation or using your vehicle. Our car rentals are diverse regarding car models, fuel consumption, size, and functionality. We aim to deliver the car that will suit your needs. At the airport, we avail valet services to clients who need the service. Valet service is essential in stack parking at peak hours and also to provide luggage assistance. Valet services are very pocket-friendly. Our ride- sharing facility provides transport arrangements for travelers new to St. Louis or travelers needing private transportation means while navigating the St. Louis area. When you list your vehicle for the ride-sharing service, you give TravelCar the authority to lease out your vehicle and manage the affairs of your vehicle for the time you will be away. The vehicle is availed for use by other travelers who pay for the period they will be renting it. As the car owner, you get relieved of some maintenance costs and insurance costs of the vehicle. Additionally, you stand a chance to receive revenue depending on the mileage your car has covered while you were away on your trip. For the car rentals, you have the freedom to select an automobile whose fuel consumption you can afford. Moreover, the car should be suitable for the terrain and relevant to the occasion. You can choose a car depending on the number of passengers boarding the vehicle. TravelCar will make arrangements for the car’s drop off points after use. Travelers who require valet service at St. Louis Lambert International Airport are advised to request the company in good time before arrival at the airport for a smooth transition to occur. Valet service is accessible 24 hours a day, on all days of the week. Save time and effort needed in parking and enjoy the perks TravelCar has to offer. Customer support is essential to a traveler to advise and direct on the booking procedures, parking locations, car pick up and drop off points. Customer service is available 24/7 throughout the year. St. Louis is known for the Gateway Arch that highlights a beautiful waterfront skyline. The Gateway Arch is hosted in the Jefferson National Expansion Memorial Park.